There is one day of the year when sinking into the couch for hours on end is not just socially acceptable, but required. When nacho cheese dip counts as its own food group. When sweatpants and sports jerseys are the only appropriate attire—and shoes are forbidden. When staying inside all day is a-okay. When no one counts calories or argues over the remote or bugs you about fresh air or exercise. What is this glorious day? Super Bowl Sunday, of course—and it’s right around the corner. Which means it’s time to prepare your man cave. But what do you need to make sure you’re ready? Read on. Furniture Fair has got you covered. Grab a chair…and lean back. Every man cave needs cozy seating and every man cave connoisseur knows that the coziest seating in existence is the recliner. Why? Because a recliner starts out comfy, with its extra-wide seat, cushy back and puffy arms—but then, with the push of a button, it leeeeeans back, and gets much more comfy. With full back support (and feet too! ), we’re talking comfier than your bed—which is why there is no shame in falling asleep in one of these guys. Furniture Fair boasts a massive collection of recliner options to fit any design scheme or budget, from the sleek and affordable Mendon Recliner to the plush, overstuffed comfort of the Capehorn Rocker Recliner (it rocks, literally!) to the Rolls Royce-esque luxury of this leather and hardwood Motorized Reclining Chair by Smith Brothers. 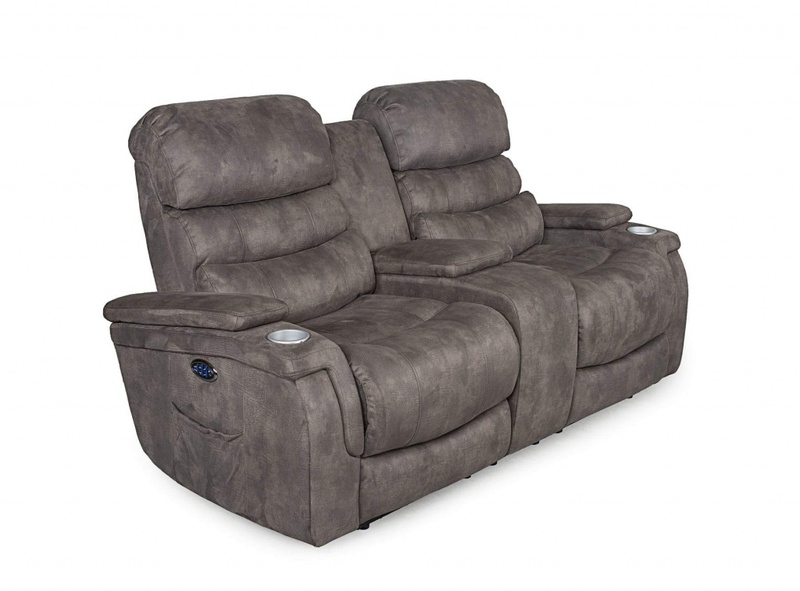 Southern Motion furniture even offers the SOCOZI line which includes heat and massage in reclining furniture. In addition to that, Southern Motion is a made in USA brand with special order options so you can customize your look to maybe match the colors of your favorite team. Or take it up a notch with a reclining couch. Want to spread the wealth? Recliners at Furniture Fair aren’t just a one man show. You can bring a partner into the mix with one of their reclining loveseat options, like this handsome brown Hogan Reclining Loveseat or this Albuquerque Power Reclining Loveseat with cup holders, storage console, power headrest and lumbar support, and built in USB ports. Take the occupancy up to three with this Atlantis Power Reclining Sofa, or get the party started with a reclining sectional, like this beautiful chestnut leather Stampede Power Motion Sectional—it comfortably seats at least five people! Snag one of these and your house will be the number one Super Bowl destination for generations to come. Make sure there are plenty of tables to hold your snacks. The Super Bowl is not the Super Bowl without snacks. We’re talking salty, crunchy, gooey, calorific munchies meant for lining the stomach and washing down with beer, chips and dips, chicken wings, chili, pizza…the list goes on. But you can’t put these things on the floor, because the last thing anybody wants is a sock full of nacho cheese (or, nacho cheese full of sock…). So make sure you have a large enough cocktail table for keeping calories (and the beers to wash them down) close at hand. This beautifully built Laramie Cocktail Table, made from reclaimed poplar wood, has two levels for double the snacks. 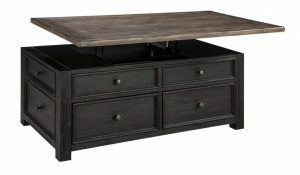 This white oak Tyler Creek Cocktail Table has a rising top and storage drawers you can pack full of napkins, utensils, and extra bags of chips. Get a large television…and something to put it on. You can’t watch the big game on a tiny screen, so make sure to upgrade your man cave with a television that fits the room (helpful hint: multiply your seating distance from the TV by 0.84 to get the optimum screen size for your space). But once you have that TV, you need something to put it on…and no, an old stack of magazines or a milk crate turned upside down doesn’t count. 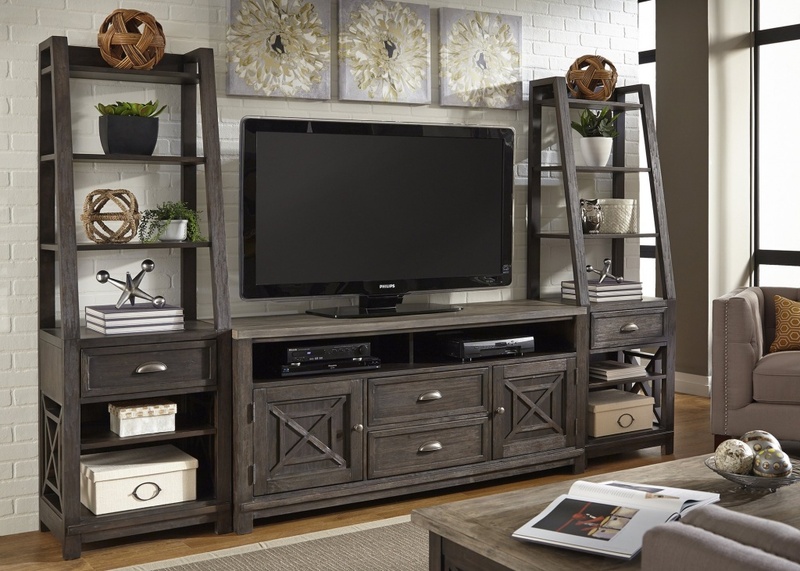 Opt for a handsome media center in dark wood like this large Budmore TV Stand with its wire brush finish and sliding barn door for storing DVD players, cable boxes, or your cherished game consul – after all, you’ll want to recreate some Superbowl highlights by playing Madden NFL 19 after the game is over! You can also go big with this Heatherbrook Entertainment Wall, which has extra shelves on each side for storing books, décor, or, you know, more snacks. BYO Bar. Want to really maximize your man cave’s potential? Then you need a bar. In addition to storing your booze collection and housing beer, the bar creates a second focal point around which guests can gather during commercial breaks (or, in the case of the less football fanatical, game breaks). Try this rustic industrial Dakota Bar with its reclaimed pine finish and add a few Dakota Swivel Barstoolsto complete the look—and provide much-needed extra seating. Then, increase booze-accessibility by filling a trio of Justin Metal Buckets with ice and beer and scattering them about the room so that no one has to get up to grab a fresh cold one. Don’t forget the small stuff. Furniture is important but so are the final details—they’re what makes your cave feel like home. A cozy floor covering like this fluffy Impact Rug from Dalyn Rug Company not only pulls the room together but creates additional seating space for kids and latecomers. 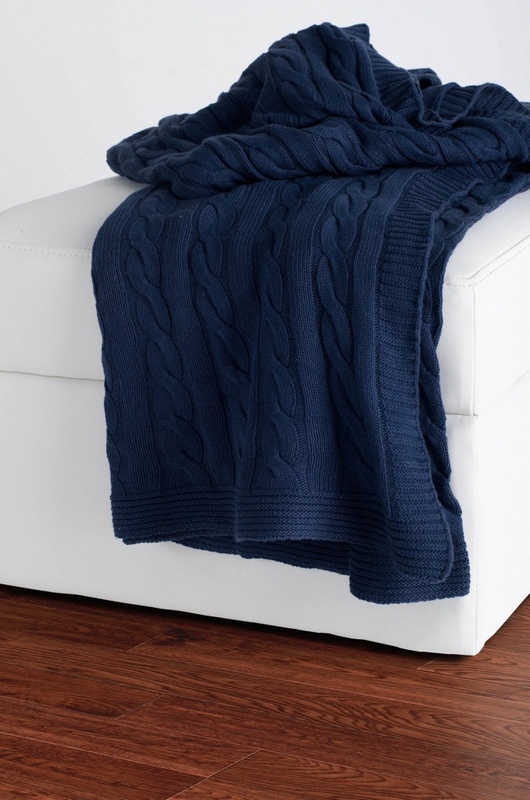 A few blankets, like these handsome Cable Knit Throws from Rizzy Home (which come in a variety of colors), are crucial for keeping the February chill at bay. And pillows, like this dapper velvet Heirloom Pine Pillow or this rustic Forest Pillow from Rizzy Home, are a must. Make sure your man cave is complete before kickoff for Superbowl LIII happens on February 3rd! After you’ve got it assembled, all that’s left for you to do to is pick up some blue cheese dressing and seven-layer dip to go with the wings and chips you ordered. Then, you’ll be ready for some football!